The pick of the best business NLP books for leadership, management, and sales, chosen by NLP and corporate trainer Andy Smith. A very clear and well-structured overview of NLP as it applies to business. Sue Knight is a UK-based trainer and consultant with a long track record in business. The book is very clearly written from the recognition that we need to make sure our own house is in order, before we start trying to apply NLP techniques to change people and situations around us. Her book is great on the importance of integrity and congruence in organisations, and on how to use sensory-rich language in corporate communications. I also found this book useful in my work in brand positioning a few years ago. Most of the NLP basics are covered, with the exception of some of the purely therapeutic patterns (such as the ‘phobia cure’) which are not really relevant in a business context. The reader benefits from an attractive layout, with plenty of images and diagrams, readable chapters, and plenty of practical exercises and ‘thought-provokers’ so that you’re not restricted to passively taking in information. This third, expanded edition includes chapters on humour, clean language, and time. Highly recommended! 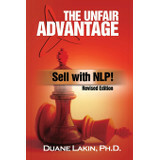 This is the classic work on using NLP in sales, meetings and negotiation. One of the best things about this book is that, as the title suggests, it effectively answers that old chestnut about NLP being manipulative. The author has a gift for keeping things simple. Let me give you an example: the NLP “Meta Model” is a set of questions which you can use to clarify what someone is saying to you, and to spot where they’ve left out vital information or left things so vague that misunderstandings creep in. It’s extremely useful in a work context – for example, so that you can make sure before you put loads of effort in that the project you’re delivering for your boss is what she actually wanted! The only problem with the original Meta Model is that there’s quite a lot of questions to remember – twelve or thirteen in most versions of it. This is too many to remember without a lot of practice, as the conscious mind usually has difficulty coping with more than about seven chunks of information at once (if you’re having a bad day, the figure is more like five). In the book, Genie boils the Meta Model down to just five types of “Pointers” which you can “anchor” to your fingers so you can remember them easily! She also has useful exercises to help you sharpen your sensory awareness, and plenty of useful material about effective meetings, business communication, and how to negotiate. 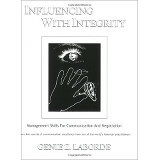 “Influencing With Integrity” is on the recommended reading list for my NLP Practitioner courses. Anyone in business will benefit from reading this. If you’re looking for an NLP book written from the perspective of someone with real, solid business experience, this is it. This book is packed with real examples from Molden’s career as a training and development manager and subsequently as a consultant. This would not be the place to get a step-by-step in-depth description of every NLP technique – rather, the book is focused on practical applications of NLP to common business problems, and it’s all the better for that. 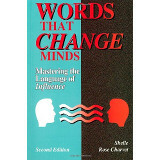 Having said that, the book does cover a lot of NLP material from many sources – even including a “mind programming unit” for turning up or turning down the emotional impact of your memories and imagined events which is inspired (if I’m not mistaken) from Richard Bandler’s more recently developed “Design Human Engineering”. There is also a useful section on modelling excellence which, although it may not satisfy NLP purists, is designed so that anyone can use it to get valuable results. 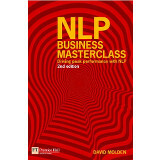 Molden has invited other consultants using NLP in business to contribute chapters on their areas of expertise. Along with his own contributions, this gives us a wealth of applications to areas including customer service, time management, presentations, risk assessment and running better meetings. The book will be equally useful to two quite different types of readers: managers looking for high-impact interventions without the jargon, and NLP practitioners looking for innovative and practical ways to apply their skills in business. Unlike some of the other books I’ve reviewed, this one does not attempt to cover the whole of NLP as it applies to business. Instead, it goes into depth on just one area: meta programs. These are the “content-free filters” we use to filter incoming sensory information and so make up our model of the world. This might sound heavy, but it isn’t at all – thanks to Shelle’s writing style she presents the subject in a simple, understandable and highly readable way. The model she uses is based on the Language and Behaviour (LAB) Profile developed by Rodger Bailey – a simplification of the original 60 (!) meta-programs down to 14, along with the questions you can use to elicit them. This is a kind of psychometric test, although as people may have different meta-programs in different contexts, and they may change over time, it’s emphatically not about pigeonholing people. Just as importantly, Shelle also tells you the kind of language to use to reach particular kinds of people – useful in sales, negotiation, motivation and deciding who to hire for a particular job. She even tells you how to write recruitment ads to appeal to people with the right meta program profile for the job, so the unsuitable applicants won’t even contact you! For the depth of information it covers, the book is surprisingly chatty. There are even some cartoons! And Shelle has a very sharp sense of humour. 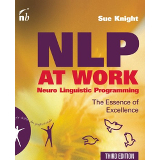 This is very different from the other NLP books I’ve reviewed. It’s targeted at one specific application area – sales. 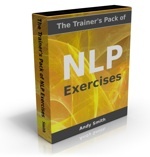 If you are a sales professional who hasn’t come across NLP before, implementing the techniques in this book will return your investment hundreds of times over. As befits its target market, there is very little theory in the book – in fact it’s mostly exercises. You’ll have to do the exercises to get the benefit. The book takes you through using NLP in face-to-face sales, direct mail, and telemarketing. 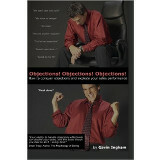 There are also some very sneaky objection-handling techniques.